TBILISI, DFWatch–Government officials in Georgia claim it will not bring serious financial harm to the country if Russia suspends its free trade agreement with Georgia. On Wednesday, the Russian Duma was reported to be preparing a draft bill about suspending the free trade agreement with Georgia from 1994. Prime Minister Irakli Gharibashvili tried to downplay the potential impact of losing the free trade agreement on Thursday and said the government is to hold consultations about this issue and will also discuss it with Russia. “I think we will achieve agreement. This is not a great tragedy. We will consult and later make a comment,” he said. Zurab Abashidze, the PM’s special representative for Russian relations, who holds regular talks with Deputy Foreign Minister of Russia mostly about economic issues, said that suspending the free trade agreement might make Georgian products a bit more expensive on the Russian market and export will become more complicated. “There is some political element in this decision,” he told Maestro TV. Russia took the same type of measures against Ukraine and Moldova, so it was expected that it would to the same kind against Georgia. “We assumed such a possibility, but I think this is not a tragedy or great trauma. Both of our states are members of the World Trade Organization. 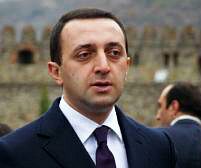 There are rules of the game and we will live by these rules,” Gharibashvili said. Even though Georgian products might get more expensive, the country must get used to it if it wants to become part of Europe’s economic space, he reasoned. If the agreement of 1994 is suspended, Georgia will have to trade with Russia ‘ordinarily ’ just like many other countries in the world. Deputy Economy Minister Mikheil Janelidze agreed that revoking the agreement cannot bring significant problems for Georgia’s economy and that export of Georgian products to Russian market will continue. He said at a press conference on Thursday that it is important to regulate trade and cultural humanitarian relations with Russia. Georgia signing the Association Agreement with a Deep and Comprehensive Free Trade Agreement (DCFTA) with EU is not directed against anyone, including Russia, he argued. He said if Russia suspends its free trade agreement with Georgia, it will mean that customs clearance fees are slapped on Georgian products, but it won’t be more than 20 percent, as this is the maximum fee agreed by Russia with WTO. This means export of Georgian products to Russia will continue, he said.